Awake & Moving: Emerging From Within: Illustrator Amber Zuniga Opens Up. 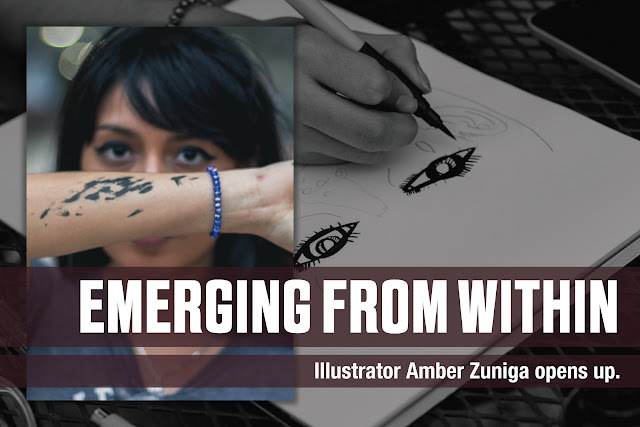 Emerging From Within: Illustrator Amber Zuniga Opens Up. Amber Zuniga is shedding ink. 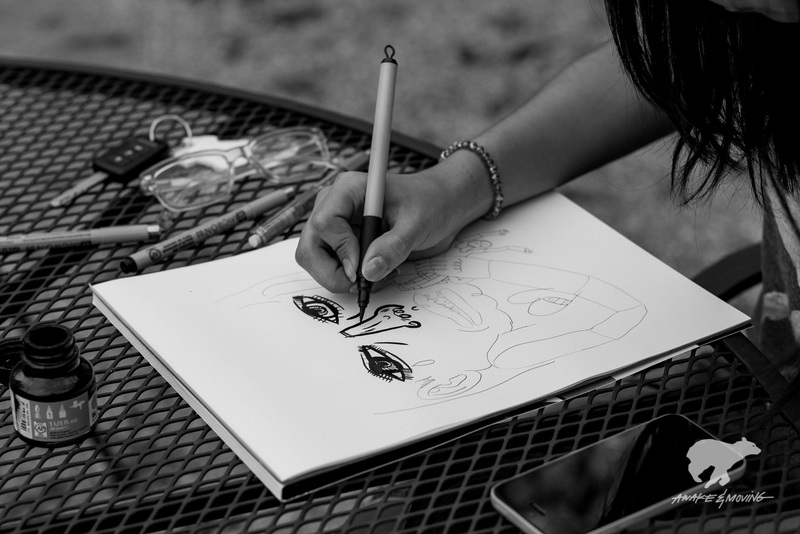 Amber is a budding, young artist from Donna, TX with a knack for illustrating some humorous imagery that often also evokes a sense of something darker and more emotive. Her work is very line-driven with a fluidity that only ink & brush can provide. 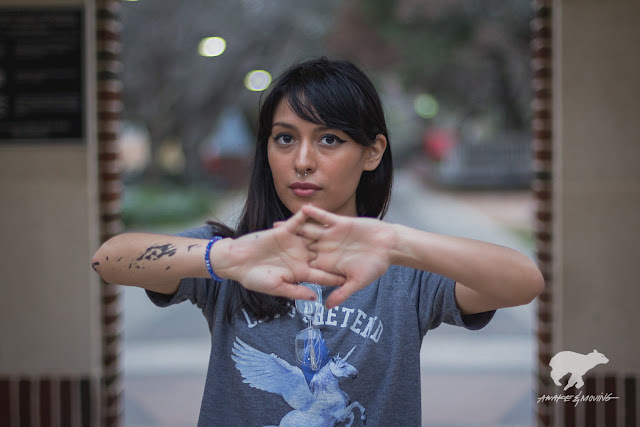 Now residing in San Antonio, Amber is beginning to make her mark in the city through her colorful use of good humor, while still adjusting to life away from familiarity, community support, and family. It takes a strong-willed person to be able to pick it all up and leave behind the norm for the love of creation that simply must come out. 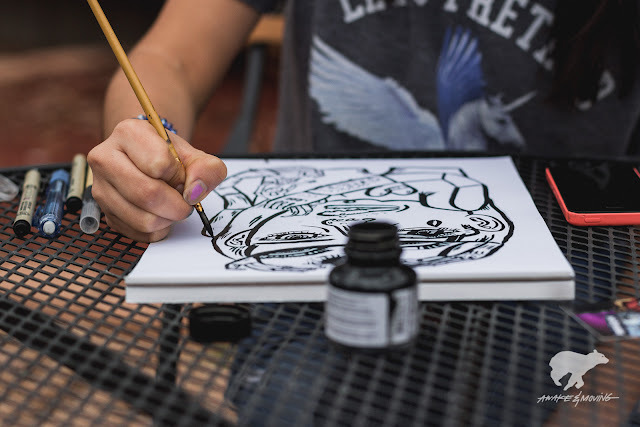 I sat with Amber as she created a fresh new illustration on the fly while we discussed creative passion, changing cities, and our shared affection for brush pens. BLUE731: Amber, what’s new in your world and how are the pixels & brushes treating you? AMBER: Things have been going pretty well lately. I was stuck in this sort of, artist’s block for quite some time, until late December, and [recently] I just started spewing things out. It hasn’t stopped yet. How would you describe your illustration style to someone who hasn’t seen your work? Very abstract. I have somewhat of two different styles. One is very cartoon-like, I’ve heard people compare it to Adventure Time so many times. I’d say it’s a bit humorous, also. When I draw something, I don’t really have a theme in mind. It’s just not something that I am conscious of. Whatever I draw is whatever I draw. The flow of a great brush pen. What I’ve noticed myself in your work is that there’s a certain ping-pong of cynicism and good humor. Where does this come from that you can create two very different dynamics? The happier stuff...I’m not gonna say that I force it...I’m not too much of a naturally happy person. When I do make something that is a bit humorous, it’s drawn with the intention of [making] myself feel better. I draw it so that way it might help others feel better, to take a break from the seriousness of life. And the darker stuff, I love creepy stuff. I love morbid, crude, and sadistic humor. You’ve recently been exploring digital art. How do you approach something digitally versus traditionally? The digital works I’ve made so far have been sort of, like, tests for myself to see if I can execute something rather well using Illustrator and Photoshop. It’s become a little addicting lately just because it’s so efficient and there’s a plethora of colors to choose from. I’m a big fan of color so that’s nice because I don’t work with color when I’m inking. 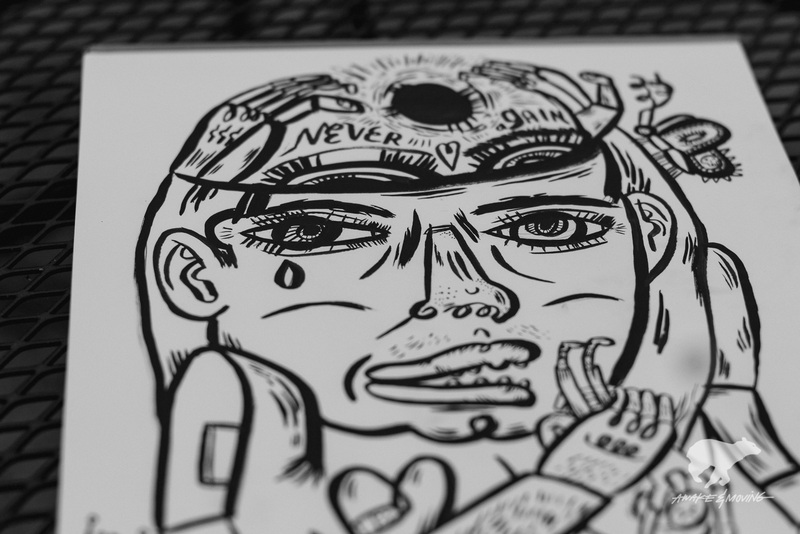 When I draw something on paper with ink it’s usually a release of built-up emotion. So, I like to express what I’m feeling through the strokes, through the heaviness, the jaggedness, and just the messiness of it all. I just like to get it all out this way. It’s really therapeutic that way, in that sense. From Donna to San Antonio. You’ve come quite a ways from South Texas, how did you end up here in San Antonio and what prompted you to stay? I was on a family trip, my brother came to the Tower of Americas on a field trip. I’ve known Joseph (Brosephyo) for about three years, we met on tumblr and we’ve only ever communicated through tumblr, or Instagram, or snail mail because he would send me some of his designs. It just so happened to be that the time we were here he was having his senior exhibit. He invited me to come see that, so I did and I ended up falling in love with what all the seniors made in the graphic design program. The school that I was attending, I knew it wouldn’t challenge me the way I feel that I should be challenged, so I decided to come to Incarnate Word. What has been your biggest adjustment to life here? Getting entwined with a social circle. I’m very reserved, I’m not shy, but I am self conscious in some areas. I have a difficult time talking to people, I have a difficult time making friends. I left all my friends back at home and came to a completely new environment. I don’t know the area, I didn’t know anybody. It’s definitely taken a while, but I think I’m good now. From pen & brush to computer & color, Amber has found her calling. You certainly seem to be adjusting just fine. If you could collaborate with any other artist in any other media, who would it be? I love Esao Andrews, the artist who does the artwork for Circa Survive, I love his style. Tuesday Bassen, her work is comical and I do get a lot of comparisons to her work. How do you feel when people makes comparisons of your work to other artists? I used to be annoyed, it used to be something I hated. As time went by, I matured and I realized as hard as somebody tries--originality, in my eyes, doesn’t exist. There’s always something being taken from different artists that influence you. In the past I may have said something rude, but now I take a look at the other artists’ work and I’ll find something I appreciate about it. I like comparisons now. It's definitely an ego-check at times. What is something you’d like to convey or accomplish with your art this year? I’d love to have my own exhibit with a series of hand drawn illustrations. The final image. It's always great watching artist create on-the-spot. In terms of tools, what is one brush or one pen you couldn’t live without? This! My Kuretake brush pen. I wanna say it’s a No. 8 brush but all the packaging is in Japanese. I can do without sketching beforehand. I’ve tried using just a brush, too. I used to invest in brushes too, but they just never worked. Then I found this and it’s...I can’t describe it. It’s amazing! It truly is, I love brush pens in general. If there was one thing you would want our audience to know about you or your work, what would it be? You really got me on this question! Everything...artists are never satisfied with themselves. I’ve made so many drawings, I wanna say I’ve made hundreds of drawings and I’ve only ever been satisfied with just one. So when people tell me how much they admire my work or tell me,”Oh, you’re so talented!”, I take it sometimes lightly because I’m so hard on myself. I want them to know that when they say things like that, although I take it lightly, it means a lot. To have somebody that’s able to make their own conclusions about a piece that I’ve done...there’s a sense of accomplishment. The scatterings of a fresh tattoo. Why do you do this? What drives you? I’ve tried answering this myself and I can’t really come to an answer that everyone would understand. I know I’m passionate about this because I’ll wake up and instead of going to brush my teeth and wash my face, or you know...I put artwork before hygiene sometimes! I’ve pulled all-nighters just doing my personal work. So I figure if I’m subjecting myself to that sort of “torture” then I think it’s my calling. 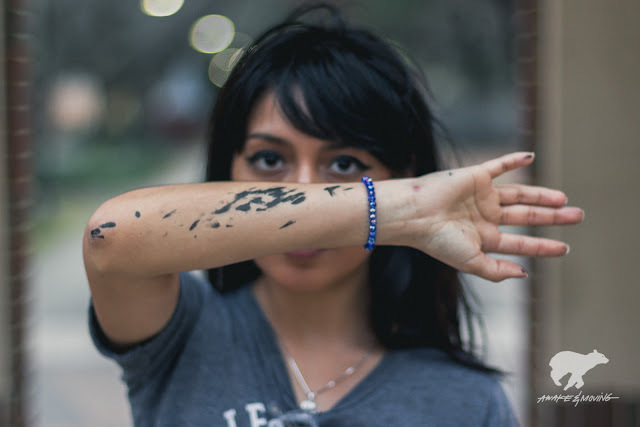 Passion over hygiene seems to capture creative minds often. Thank you for your time, Amber, and for taking us along your process. Be sure to check out more of Amber's work on her website and her Instagram.